I wanted to do something different and present an illustration rather than just text answers. What is nice of the TI-84 Plus (and really the TI-8x family extending back to the TI-81) is that the programming language allowing for easy transition between modes (home, graphing, matrix editing, table, etc.). With RAKEWALL, I not only display text answers, but a visual of how the rake wall is laid out. Sometimes the best way to present information is through visuals, not just text. I want to further explore this whenever it is warranted. Input: Rise, Run, O.C. (on center spacing). RAKEWALL does not specify units, keep that in mind. Use consistent units. As a reminder, 12 inches is 1 foot. Output: Angle (in Degrees), stud spacing stored in list L1, stud lengths stored in list L2. The program ends on the graph screen. Press [ trace ] to see the values. 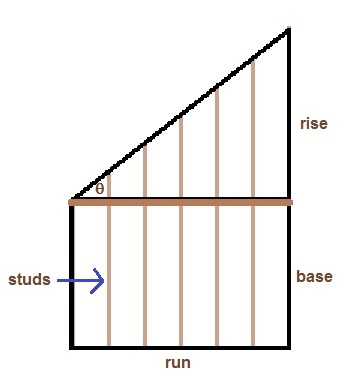 X is the length from the where the incline and base meet to the stud, Y is the stud length. Please note that results are exact and not rounded (i.e. to the nearest 1/16th). Disp "(L1: DIST. FROM SHORT PT." This program was inspired by the Calculated Industries Construction Master 5 calculator. I am thinking about purchasing their Construction Pro calculator (most likely the app).